Nobel Laureate Muhammad Yunus, founder of Grameen Bank, addressed students from the NYU Stern School of Business and NYU Wagner School of Public Service during a special lecture and Q&A session. 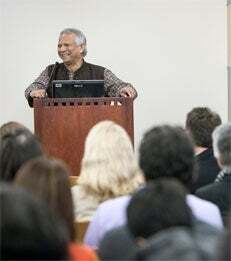 Professor Yunus shared his passion and vision for serving the poor through inclusive social businesses, including Grameen Bank, which serves millions of poor households in Bangladesh and around the world. He also emphasized that today’s schools, organizations and initiatives need to produce fewer job seekers and more job creators. This event was co-sponsored by NYU Wagner's Financial Access Initiative and NYU Stern.